Joseph Campbell stated that, "myths are clues to the spiritual potentialities of the human life." 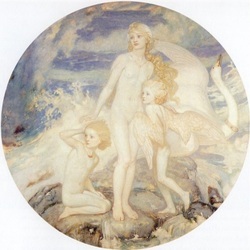 The fairy, Melusine, was the daughter of the fairy Pressyne and King Elynas of Albany. She became the fairy Queen of the forest of Colombiers in the French region of Poitou. One day, she and two of her subjects were guarding their sacred fountain when a young man, Raymond of Poitiers, burst out of the forest. Melusine spent the night talking with Raymond, and by dawn, they were betrothed, but with one condition. Melusine requested that Raymond promise that he would never see her on a Saturday. He agreed, and they were married. Melusine brought her husband great wealth and prosperity. She built the fortress of Lusignan so quickly that it appeared to be made by magic. Over time, Melusine built many castles, fortresses, churches, towers and towns, each in a single night, throughout the region. She and Raymond had ten children, but each child was flawed. The eldest had one red eye and one blue eye, the next had an ear larger than the other, another had a lion’s foot growing from his cheek, and another had but one eye. The sixth son was known as Geoffrey-with-the-great tooth, as he had a very large tooth. In spite of the deformities, the children were strong, talented and loved throughout the land. As a result, Melusine turned into a fifteen-foot serpent, circled the castle three times, wailing piteously, and then flew away. She would return at night to visit her children, then vanish. Raymond was never happy again. Melusine appeared at the castle, wailing, whenever a count of Lusignan was about to die or a new one to be born. It was said that the noble line which originated with Melusine will reign until the end of the world. Her children included the King of Cyprus, the King of Armenia, the King of Bohemia, the Duke of Luxembourg, and the Lord of Lusignan. D’Arras, Jean. Melusine. Edited by A.K. Donald. London: Kegan Paul, Trench, Tribner & Co., 1895. Published for the Early English Text Society, Extra Series 68. New York: Kraus Reprint Co., 1975. Around the world, we see the same tales of how one ’god’ was instrumental in assisting humanity during creation, the great flood, bringing knowledge to humanity. All cultures have their own creation stories of the ’gods and goddesses,’ that came from the skies, giants (Anakim), war epochs between two sides of a family. All over the Earth we also share very similar artwork, music and technology, largely based on ultraterrestrial activity and intervention. From Lemuria to Atlantis to Sumeria to Egypt. These portray the story of our cosmos, the constellations, sun and moon, precession of the ages, put into human and "god" forms. Their forms are numerous, from Anu, Enki and Enlil, Cain and Abel, Jacob and Esau, Joseph and his brothers, Moses and Ramses, Hatshepsut and Tuthmose, Akhenaten’s one god versus the many deities; to Inanna with her insatiable greed for power and adoration who still failed to realize that without her possessions she was nothing. Since Evil is here "haunting this world by necessary law", and it is the Soul's design to escape from Evil, we must escape hence. ~The Enneads; The Virtues; Section 1; by Plotinus. As speech is the echo of the thought in the Soul,so thought in the Soul is an echo from elsewhere: that is to say, as the uttered though is an image of the soul-thought, so the soul-though images a thought above itself and is the interpreter of the higher sphere. ~The Enneads; The Virtues; Section 3 by Plotinus. The Soul's true Good is in devotion to the Intellectual- Principle, its kin; evil to the Soul lies in frequenting strangers. ~The Enneads; The Virtues; Section 4 by Plotinus. The Soul admits the imprint, graven upon it and working within it, of the vision it has come to. ~The Enneads; The Virtues; Section 4 by Plotinus. For it is to the Gods,not to the good, that our Likeness must look: to model ourselves upon good men is to produce an image of an image: we have to fix our gaze above the image and attain Likeness to the Supreme Exemplar. ~The Enneads; The Virtues; Section 7. Uranus characterizes the original evolutionary impulse -- the mystic grandfather of all existence. The story of Uranus is rooted in the Greek Creation Myth. It speaks to us from the remote depths of the unknown, before the birth of human consciousness. It represents an aspect of the universe which appeared before space and time (Cronos). Zero is pure unmanifest potential, even prior to the original impulse. Its psychic equivalent is superconsciousness. In the Tarot, this trump is numbered 0, and alternately 22, implying it is nothing and everything. All matter plus gravity in the observable universe equals zero. So the universe could come from nothing because it is, fundamentally nothing (Guth, 2002). In the Vedas, all creation is considered mindstuff -- an illusion of being. Return to the primordial vacuum, a boiling stew from which pairs of positive and negative subatomic particles bubble into being for the briefest of instants. Inflationary theory suggests that what erupted was a "false vacuum," a peculiar form of matter predicted to exist by many particle theorists. It is characterized by a repulsive gravitational field, one so strong it can explode into a universe. The false vacuum does not "thin out" during expansion; rather, its density remains constant even as it grows, creating vast quantities of ever-doubling energy, which decayed into a seething plasma of particles such as electrons, positrons and neutrinos. This hot soup neutralized to form simple atoms 300,000 years later. The simple atoms, like hydrogen, helium, and lithium, were ripped apart and crushed together to form more complex, heavier atoms insisde stars. Exploded into space by supernovas, they became the matter we see--and are--today. In terms of personal experience Uranus represents experiences from conception through growth in the womb (space/time) and emergence into independent existence. It is pre-conceptual consciousness, pure creative consciousness emerging from the fount of Chaos. Uranus is a god of the starry heavens, and was not the first force to appear in the Universe. According to this classical myth, only Chaos existed in the beginning. The seemingly random element produced Gaea, the deep-breasted earth or matter, from within infinite potential. For matter to exist, the force of attraction also had to appear (super-celestial Eros). Uranus, the starry heavens, is Gaea's first-born child. In other words, the first descent of matter into the threshold of concrete existence came from a chaotic matrix, the virtual vacuum fluctuation. This cosmic trinity of chaos, matter, and attraction lies at the heart of modern chaos theory. It bears directly on another Greek archetype that we all share--the psyche. Scientists have found that the principle of underlying chaos deterministically conditions many of the patterns of physical existence. Chaos is found in our brainwaves, heartbeats, the fractal structure of our breathing, circulatory, digestive, and nervous systems. We see chaos in all natural processes from the weather to evolution. And the turbulence in our lives reminds us that "we are that." We repeat the creation myth when we are conceived as living beings from the raw material of atomic substance in interaction with the universal consciousness field. Scientists tell us now that we are made of same stuff as the stars. Our elements were forged in a supernova explosion. The material of the universe is constantly recycled through many forms. The interaction of positive and negative elements results in the force of attraction, variously termed gravity, electromagentism, or love, or conception. Thus the force of generation arises, or is born. The age of the Titans meant that mankind lived in harmony with his instinctual nature, since he had no awareness to set up a conflicting point of view. There was no dichotomy. The Titans were the forerunners of astrological signs of the Zodiac and included Theia, Rhea, Mnemosyne, Phoebe, Tethys, Themis, Oceanus, Coeus, Hyperion, Crius, Iapetus, and Cronos, plus assorted monsters. But, Uranus, had a curious relationship to his offspring and sought to repress their appearance. His method was to push them back into their mother, or imprison them in matter. This repression of instinctual energies seeking a form in matter results in a blockage or obstacle which manifests as a psychosomatic disorder. That which cannot achieve spiritual birth is condemned to manifest in matter, since it can achieve consciousness no other way. The repressed instinct confronts the human awareness in such disorders as asthma, allergies, and colitis. No wonder the body gets indigestion from these "children" being shoved back down its throat. The body is forced into hysterical over-reaction and peculiar immune system response. Uranus represses his own power of creativity, or at least its manifestations. The result is the seeds of rebellion sprout in a plot between Gaea and Cronos. Time and materiality conspire to limit the domain of Uranus. The genetic pattern is continuing to unfold and more and more structure develops in the fetus. Over time, corporality creates a more developed central nervous system which develops qualitatively different perceptions from the undifferentiated organism. When Cronos or Saturn solidifies as the ego, the Uranus consciousness is recalled as a pre-egoic state of intimate identification, undifferentiation. Cronos castrates his devouring father, emasculating him and freeing his siblings. Archetypal patterns repeat themselves over and over. Archetypes function in the psyche like the magnetic strange attractors of chaos theory. They are the center around which certain patterns gravitate. Time and matter eventually limit the manifestation of the archetypal instincts. We become conditioned to some patterns over others. Our total potential becomes limited to a finite portion of fate or destiny which our brief lifetimes afford. They return to their mythic dimension when we die, and our atoms are transformed back into their primordial elements, perhaps to recombine in vastly different bodies. The main issue or myth theme of Uranus is the tendency to drastically limit his own potential for engendering and procreation. There are many forms of physical creativity. With no foresight or hindsight, and no perspective on time, he fought against the actualization of his own creative potentialities through self-destructive reactions. When we engage in self-defeating, self-sabatoging efforts that nip our creativity in the bud, we are acting like Uranus. This hostile ancestor was a reluctant progenitor, who paid dearly when time finally caught up with him. Uranus reveals the underlying matrix of Chaos at work in the universe. It is a structure-annihilating force. It shows while spirit is still working through material conditions it is completely controlled by the mind. Uranus is the great synthesizer of the various aspects of intelligence symbolized by all the planets and weaves them into a synthetic whole, and from that comes the fully individualized human, the complete person, the master. This paradox of building and annihilating forces embodies the fight against one's self, symbolized by the eternal battle between youth and old age, the generation gap. The polarity of this situation stems from the different archetypes motivating the participants. Youth resolves to live in a liberal manner, different from the traditional collective values of the ancestor, and the battle is on! The "old guard" would like to control and direct the youth into fitting into his world, but the youth would create a unique future development of his own. In our life experiences, we are sometimes the youth and sometimes the conformist, the liberal or conservative. Our position at any given time is relative to our social position, age, and relationships. Those locked in the Uranus perspective are unconscious of their attitude and lack any self-awareness or psychological insight. This yields an unconscious identification with herd instinct or group consciousness, with no room for individuality. When we move into structure, we tend to become more and more rigid, the patterns become more fixed. This order is self-generated from chaos, but when it becomes too rigid, the process moves toward chaos once again--death, decay, total de-structuring. It happens on the physical level to our bodies, to our emotions in our ups and downs, in the creation and destruction of our thoughts, and in the transformations within our belief systems. We embrace and identify with a pattern which emerges from the creative chaos, but eventually we must sacrifice it, let it go--for no pattern is our true essence. Uranus is a variation on the theme of "Sky Father," and shares this in common with Cronos and Zeus who are his descendants. As a sky father, he represents a spiritual impulse. The Greek creation myth shows the negative issuing into manifestation reflecting the Spirit in search of experience. Chaos, the gaping maw of open space is a pure cosmic principle which has no god-form. Gaea, on the other hand, was represented as a primal woman of gigantic proportions. Uranus had no cult in Greece, even though Uranus and Gaea are considered the grandparents of the world. Uranus certainly wasn't a benevolent parent, perhaps indicating that the original spiritual impulse was reluctant to manifest at all, and didn't seem to like the idea of regeneration. Its tendency was to remain abstract, but its method of repressing itself created a reactionary revolutionary, which Uranus self-generated from his own pattern. This revolution created the dimension of the experience of space and time, with several of its concomitant qualities, including absolute justice or karma, also termed natural consequences. This is known as the law of action and reaction, or thermodynamics. This furious expression of Cronos is not tempered by Mercy until the appearance of his offspring Zeus. Thermodynamics (Cronos) and matter (Gaea) led to the manifest universe. Gaea also created the first race of gods, and gave birth to the first human. She contained within herself the gift of foretelling the future. She contains all the potentiality for manifestation, as is therefore a prophetess. Also she is the guardian of the sanctity of oaths, including the marriage oath. This is another arc of the relationship among polar opposites. The spiritual myth which exemplifies the cosmological nature of Uranus is that of the ANCIENT OF DAYS. There are a few variations of form for this cosmic man, depending on the level of functioning in the creation. It has different names on different planes. The Most Ancient One, or Ancient of the Ancients creates and produces the essence of light (Zeus). This primordial Being, also known as the Vast or Great Countenance gives birth to the Lesser Countenance or primordial Man. The image is one of the Father of All Things, the Sacred Ancestor, "The White Head." In the Hebrew text THE ZOHAR describes the ancient one as wearing white robes. His face is vast, luminous, and terrible. He sits on a throne of flaming light. The white light streaming from His face illumines four hundred thousand worlds. Thirteen thousand myriads of worlds come into light from His skull, which emanates a mysterious dew that has the power to awaken the spiritual dead into everlasting life. This "Great Face" or "Long Face" is that of the Aged of Aged who has been before the beginning. He generates the "Short Face" which is this Creation. The hair and beard of this Ancient of Ancients extends to the uttermost parts of the universe. From His skull hang down a thousand myriad worlds, seven thousand and five hundred curling hairs which are not mingled lest confusion exist. In each curl are four hundred and ten locks of hair and these hairs radiate into four hundred and ten worlds. In the hollow of His skull is the supreme hidden Wisdom. His brain extends by the thirty-two paths of the Tree of Life. Thirteen fountains flow forth from His beard. His hands pour out the Mother and Father rays. As the Ancient of Days, God issues from his concealment. The abyss of Deity is the body of Macroprosopus which gives birth to Microprosopus, the god-image in man. In the Qabala, the primal sphere Kether emanates forth from the vast ocean of spirit. Kether is called the which is Limitless Light Which is Not and also the Fiery Darkness. Kether is also identified as Ain, Nothingness -- the Absolute No-Thing and root of Every-thing. At some infinitesimal place between Zero and One, there appeared a slight excess of matter over anti-matter which created our universe. who was also the Sun-God, rising out of the sea each day and disappearing back under the waves each night. He was a civilizing force for the good, bringing light and life to his people, representing the positive values connected with the sea. Oannes' Goddess counterpoint was Atargatis, a Semetic moon Goddess who became the first official Mermaid and represents nature herself.. The Mermaid is the most persistent and pervasive symbol of the old Goddess energy that represents women, particularly their mysterious, life-generating element. However, battling the Ancient ways in an effort to establish itself, the early Christian church promoted the ideas that mermaids were dangerous temptresses and had no souls, but embodied the lure of fleshy pleasures to be shunned by the God-fearing. The anti feminine propaganda was also carried out against many harmless old women who were put to death as witches by burning or hanging for practicing traditional herb-lore. Similarly the Goddess-Mermaid was stripped of all her spiritual qualities and relegated to be an evil Siren of the seas. Such views have endured in the many sailors stories that simultaneously tell of one family of mermaids, the Nereids, who were protective of sailors, whilst another, the dangerous Sirens, lured men to their doom. In contrast with such negative portrayals, the earlier myths and legends such as those of the Isle of Iona, off the west coast of Scotland, present many tales in which Mermaids and Druids abound in happy community. Known as the Isle of Druids and once called Innis nan Druidhneach, Iona is known to be a 'thin place' where the veil between worlds can be traversed, a place where the sense of the sacred seems more pronounced than in more mundane parts of the world. Iona was also a seat of learning long before the first Christians first came to these lands. There are tales that a new Divinity will take human form on the Isle of Iona, this time in the body of a woman, an amalgam of the Divine Sophia and the Goddess called by many names including Brith, Brid and Mary of the Gael. It is said that when She arrives, the world will know peace. In this film we also see the Selkie, who according to Celtic folklore is mythological shapeshifting sea fairie, usually living in the form of a bright-eyed seal and found in Northern Scotland and the Shetland Islands. In earlier times Selkies often came to land in a human form, where they would dance, especially on the night of the full moon. In taking human form the Selkies would shed their Seal-skins, and hide them in a safe place. There are many tales from the clans of leaders taking Selkie wives by stealing their skins, because Selkies are said to make good wives, although they always longed for the sea, and would return to their Seal form as soon as they gained repossession of their skins. Fortunately for us, our Selkie was not pursued by anybody, but runs free to this day, as far as we know. Following Lisa Thiel's lead in her beautiful song, in this film we celebrate the life giving goodness of the Goddess of the Seas, the Mermaid Queen restored. For the sake of narrative unity, I have named our Scottish man Morcant-Taisch, composed of two ancient Celtic names, MorCant meaning Sea Circle, or Circle of the Sea, and Taisch being the Celtic name given to those with the Second Sight. Morcant-Taisch then has been blessed with the Second Sight and sees the Queen of the Mermaids visiting her ancient kingdom of Innis nan Druidhneach, The Isle of Iona. In addition Gaelic pipes and nature sounds c/o freesound.org. To Laufey Markstein of Trident Creations for providing the Menhir. And The Asylum Island coral reef park, courtesy of samothyerac Savira. Mermaid Rock co oborotuki Obolensky. Filmed on SecondLife via Snowglobe 1.4.2. Made using Frapps, Serif MoviePlus X3 on Windows XP. Conceived, Directed and Produced by Celestial Elf 2011. When Lir heard that, he came for the girl and married her, and brought her home to his house. And there was honour and affection with Aoife for her sister’s children; and indeed no person at all could see those four children without giving them the heart’s love. And Bodb Dearg used often to be going to Lir’s house for the sake of those children; and he used to bring them to his own place for a good length of time, and then he would let them go back to their own place again. And the Men of Dea were at that time using the Feast of Age in every hill of the Sidhe in turn; and when they came to Lir’s hill those four children were their joy and delight, for the beauty of their appearance; and it is where they used to sleep, in beds in sight of their father Lir. And he used to rise up at the break of every morning, and to lie down among his children. But it is what came of all this, that a fire of jealousy was kindled in Aoife, and she got to have a dislike and a hatred of her sister’s children. And one day she got her chariot yoked, and she took the four children in it, and they went forward towards the house of Bodb Dearg; but Fionnuala had no mind to go with her, for she knew by her she had some plan for their death or their destruction, and she had seen in a dream that there was treachery against them in Aoife’s mind. But all the same she was not able to escape from what was before her. And then the four children of Lir turned towards Aoife, and it is what Fionnuala said: “It is a bad deed you have done, Aoife, and it is a bad fulfilling of friendship, you to destroy us without cause; and vengeance for it will come upon you, and you will fall in satisfaction for it, for your power for our destruction is not greater than the power of our friends to avenge it on you; and put some bounds now,” she said, “to the time this enchantment is to stop on us.” “I will do that,” said Aoife, “and it is worse for you, you to have asked it of me. And the bounds set to your time are this, till the Woman from the South and the Man from the North will come together. And since you ask to hear it of me,” she said, “no friends and no power that you have will be able to bring you out of these shapes you are in through the length of your lives, until you have been three hundred years on Loch Dairbhreach, and three hundred years on Sruth na Maoile between Ireland and Alban, and three hundred years at Irrus Domnann and Inis Gluaire; and these are to be your journeys from this out,” she said. But then repentance came on Aoife, and she said: “Since there is no other help for me to give you now, you may keep your own speech; and you will be singing sweet music of the Sidhe, that would put the men of the earth to sleep, and there will be no music in the world equal to it; and your own sense and your own nobility will stay with you, the way it will not weigh so heavy on you to be in the shape of birds. And go away out of my sight now, children of Lir,” she said, “with your white faces, with your stammering Irish. It is a great curse on tender lads, they to be driven out on the rough wind. Nine hundred years to be on the water, it is a long time for any one to be in pain; it is I put this on you through treachery, it is best for you to do as I tell you now. It is downhearted and sorrowful Lir was at that news, for he understood well it was Aoife had destroyed or made an end of his children. And early in the morning of the morrow his horses were caught, and he set out on the road to the south-west And when he was as far as the shore of Loch Dairbhreach, the four children saw the horses coming towards them, and it is what Fionnuala said: “A welcome to the troop of horses I see coming near to the lake; the people they are bringing are strong, there is sadness on them; ft is us they are following, it is for us they are looking; let us move over to the shore, Aodh, Fiachra, and comely Conn. Those that are coming can be no others in the world but only Lir and his household. Then Lir came to the edge of the lake, and he took notice of the swans having the voice of living people, and he asked them why was it they had that voice. “Is there a mind with you,” said Lir, “to come to us on the land, since you have your own sense and your memory yet?” “We have not the power,” said Fionnuala, “to live with any person at all from this time; but we have our own language, the Irish, and we have the power to sing sweet music, and it is enough to satisfy the whole race of men to be listening to that music. And let you stop here to-night,” she said, “and we will be making music for you. “It is time to go from this place. I do not sleep though I am in my lying down. To be parted from my dear children, it is that is tormenting my heart. “It is a bad net I put over you, bringing Aoife, daughter of Oilell of Aran, to the house. I would never have followed that advice if I had known what it would bring upon me. “O Fionnuala, and comely Conn, O Aodh, O Fiachra of the beautiful arms; it is not ready I am to go away from you, from the border of the harbour where you are. Bodb Dearg gave a great start when he heard that, and he knew what Lir said was true, and he gave a very sharp reproach to Aoife, and he said: “This treachery will be worse for yourself in the end, Aoife, than to the children of Lir. And what shape would you yourself think worst of being in?” he said. “I would think worst of being a witch of the air,” she said. “It is into that shape I will put you now,” said Bodb. And with that he struck her with a Druid wand, and she was turned into a witch of the air there and then, and she went away on the wind in that shape, and she is in it yet, and will be in it to the end of life and time. “Farewell to you, Bodb Dearg, the man with whom all knowledge is in pledge. And farewell to our father along with you, Lir of the Hill of the White Field. “The time is come, as I think, for us to part from you, O pleasant company; my grief it is not on a visit we are going to you. “From this day out, O friends of our heart, our comrades, it is on the tormented course of the Maoil we will be, without the voice of any person near us. “Three hundred years there, and three hundred years in the bay of the men of Domnann, it is a pity for the four comely children of Lir, the salt waves of the sea to be their covering by night. “O three brothers, with the ruddy faces gone from you, let them all leave the lake now, the great troop that loved us, it is sorrowful our parting is.” After that complaint they took to flight, lightly, airily, till they came to Sruth na Maoile between Ireland and Alban. And that was a grief to the men of Ireland, and they gave out an order no swan was to be killed from that out, whatever chance might be of killing one, all through Ireland. “It is a pity for me to be alive in the state I am; it is frozen to my sides my wings are; it is little that the wind has not broken my heart in my body, with the loss of Aodh. “To be three hundred years on Loch Dairbhreach without going into my own shape, it is worse to me the time I am on Sruth na Maoile. “The three I loved, Och! the three I loved, that slept under the shelter of my feathers; till the dead come back to the living I will see them no more for ever. “It is keening we are to-night; without feathers to cover our bodies; it is cold the rough, uneven rocks are under our bare feet. “It is bad our stepmother was to us the time she played enchantments on us, sending us out like swans upon the sea. “Our washing place is on the ridge of the bay, in the foam of flying manes of the sea; our share of the ale feast is the salt water of the blue tide. “Do you know who those riders are, sons of Lir?” said Fionnuala. “There is delight to-night with the household of Lir! Plenty of ale with them and of wine, although it is in a cold dwelling-place this night are the four children of the king. “It is without a spot our bedclothes are, our bodies covered over with curved feathers; but it is often we were dressed in purple, and we drinking pleasant mead. “It is what our food is and our drink, the white sand and the bitter water of the sea; it is often we drank mead of hazel-nuts from round four-lipped drinking cups. “It is what our beds are, bare rocks out of the power of the waves; it is often there used to be spread out for us beds of the breast-feathers of birds. “Though it is our work now to be swimming through the frost and through the noise of the waves, it is often a company of the sons of kings were riding after us to the Hill of Bodb. “It is what wasted my strength, to be going and coming over the current of the Maoil the way I never was used to, and never to be in the sunshine on the soft grass. “Fiachra’s bed and Conn’s bed is to come under the cover of my wings on the sea. Aodh has his place under the feathers of my breast, the four of us side by side. After that the riders went on to Lir’s house, and they told the chief men of the Tuatha de Danaan all the birds had gone through, and the state they were in. “We have no power over them,” the chief men said, “but we are glad they are living yet, for they will get help in the end of time. “It pleases us well to hear that,” they said. “It is a wonder to me this place is, and it without a house, without a dwelling-place. To see it the way it is now, Ochone! it is bitterness to my heart. “Without dogs, without hounds for hunting, without women, without great kings; we never knew it to be like this when our father was in it. “Without horns, without cups, without drinking in the lighted house; without young men, without riders; the way it is to-night is a foretelling of sorrow. “The people of the place to be as they are now, Ochone! it is grief to my heart! It is plain to my mind to-night the lord of the house is not living. “The greatness of the hardships we have gone through going from one wave to another of the sea, we never heard of the like of them coming on any other person. However, the children of Lir stopped that night in their father’s place and their grandfather’s, where they had been reared, and they were singing very sweet music of the Sidhe. And they rose up early on the morning of the morrow and went to the Inis Gluaire, and all the birds of the country gathered near them on Loch na-n Ean, the Lake of the Birds. And they used to go out to feed every day to the far parts of the country, to Inis Geadh and to Accuill, the place Donn, son of Miled, and his people that were drowned were buried, and to all the western islands of Connacht, and they used to go back to Inis Gluaire every night. And the story he told of what happened them in the end is this. And Mochaomhog was listening to them, and he prayed to God to show him who was singing that music, and it was showed to him that the children of Lir were singing it. And on the morning of the morrow he went forward to the Lake of the Birds, and he saw the swans before him on the lake, and he went down to them at the brink of the shore. “Are you the children of Lir?” he said. “We are indeed,” said they. They came to the land after that, and they put trust in Mochaomhog, and he brought them to his own dwelling-place, and they used to be hearing Mass with him. And he got a good smith and bade him make chains of bright silver for them, and he put a chain between Aodh and Fionnuala, and a chain between Conn and Fiachra. And the four of them were raising his heart and gladdening his mind, and no danger and no distress that was on the swans before put any trouble on them now. There was great anger on Lairgren then, and he went himself to the place Mochaomhog was, and he asked was it true he had refused him the birds. “It is true indeed,” said he. At that Lairgren rose up, and he took hold of the swans, and pulled them off the altar, two birds in each hand, to bring them away to Deoch. But no sooner had he laid his hand on them than their skins fell off, and what was in their place was three lean, withered old men and a thin withered old woman, without blood or flesh. And Lairgren gave a great start at that, and he went out from the place. It is then Fionnuala said to Mochaomhog: “Come and baptize us now, for it is short till our death comes; and it is certain you do not think worse of parting with us than we do of parting with you. And make our grave afterwards,” she said, “and lay Conn at my right side and Fiachra on my left side, and Aodh before my face, between my two arms. And pray to the God of Heaven,” she said, “that you may be able to baptize us. The children of Lir were baptized then, and they died and were buried as Fionnuala had desired; Fiachra and Conn one at each side of her, and Aodh before her face. And a stone was put over them, and their names were written in Ogham, and they were keened there, and heaven was gained for their souls. And that is the fate of the children of Lir, so far.